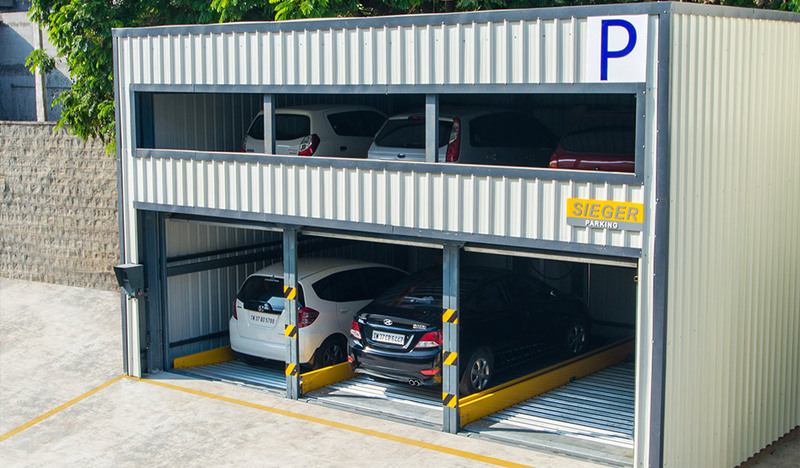 Pit-Puzzle System is aimed for optimum use of space in basement type parking. It is hydraulically designed to go vertically upto 2 levels above ground and one level (PIT) below ground. Yellow Pipe BarrierThe Pipe Barrier ensures the driver has reached the end of the pallet and he leaves the car with a happy mind that his car is safely parked. Touch Screen DisplayThe Touch Screen Display has been designed with a goal of establishing a 2 way communication between the system & the user. This ensures a positive parking experience. Photo - Electric SensorThe Sensor is set-up / programmed in such a way that it can send signals to the system by differentiating HUMAN Vs AUTOMOBILE for enhanced dual layer safety standards. RE-PARK LogicThis logic is a part of our built-in SMART LOGIC - this is a special feature to enhance the convenience of the USER, incase he has to come back to his car to pick up any forgotten items. Safety LockThis safety lock mechanism sends signals to the PLC while locking and unlocking the pallet and until which, no other operation can be performed by any means. Anti - Corrosive PlatformsThe Platform is made of galvanized Sheets and high quality paint is used for side sheets. Anti - Slip Platform DesignThe platform is designed to be very sturdy and will also avoid any human slippage. 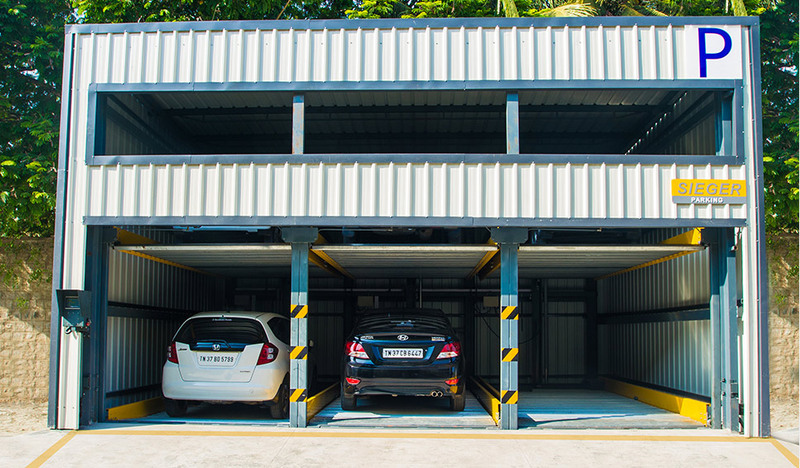 Provision to Connect to Master Controller The option to connect to the Master Controller along with all the SMART PARKING LOGIC, the entire parking facility can be managed in a breeze. One Pallet at the ground level should be kept vacant at all times for the independent puzzle operation to happen. 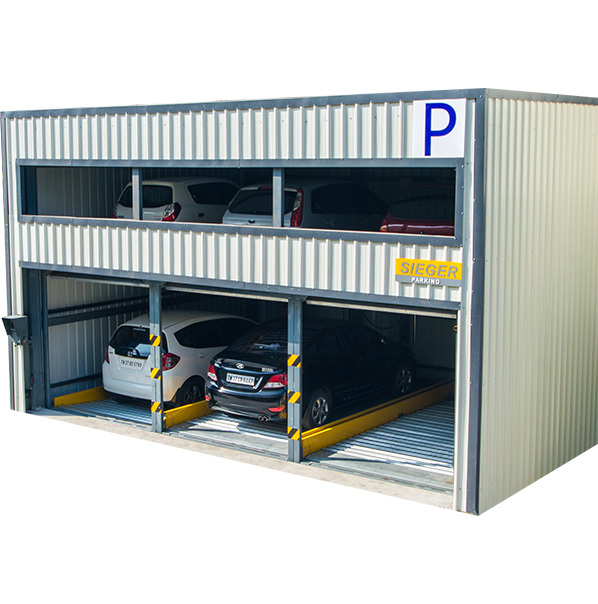 Pit-Puzzle Systems is aimed for optimum use of space in basement type parking. 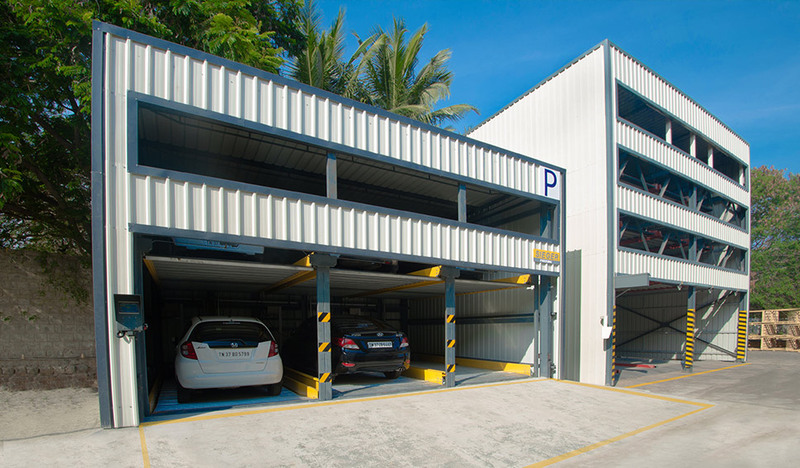 It is designed to go vertically upto 2 levels above ground and one level (PIT) below ground. Are the edges of the platforms clearly visible for the driver when he is turning to park inside the system? 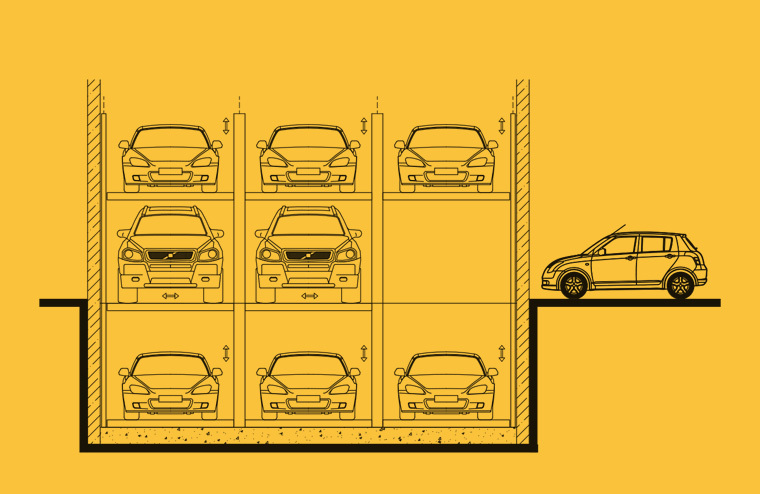 We have BRIGHT YELLOW colors on the side sheets of the platform's which makes the edges of the platform visually stand out when a driver come to park his car inside the system. When / how will the driver be sure if he has reached the end of the platform? We have a YELLOW PIPE BARRIER at the end of the platform which will ensure the car has reached the end of the platform. We also offer DOOR's (optional supply) making it even safer as drivers have to maintain the lowest speed while entering the system. What are the chances for a car overriding the platform ? With the sturdiness of the YELLOW PIPE BARRIER, it will STOP cars from overriding (provided it is not intentional and not beyond normal speed limits). How will the driver know which platform he has to park his car ? We have RED / GREEN colors on the LED BLINKERS in front of every car space in the ground level which will TURN ON that will visually make it clear when to drive in (GREEN) and when not to (RED). What if someone walks / runs inside the system when a car is coming down or going up ? The photoelectric sensor will sense the HUMAN or any other intervention and the system will STOP immediately. Is there other ways to stop interventions during the operation of the system ? Do using DOOR’s enhance safety? The operations of the DOOR’s the OPENING and CLOSING of the DOOR will be linked to the built-in SMART LOGIC which be passed on to the entire operation and that will automatically enhance the safety. How do you handle troubleshooting? SECOND: The troubleshooting standards are fixed within the LOGIC and if that is within normal troubleshooting standard which falls within these standard for most part of the times (eg: Someone walked into the system while the system was operational) the situation can be revoked back to NORMAL MODE in less than 30 seconds by the trained personnel at site. THIRD: If any other situation it will call for a service person to attend to the reason for troubleshooting.